The host talks about new actors and discusses their performances in the movies including their dancing skills and acting talent. 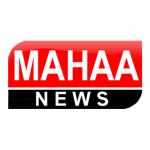 Watch Mahaa TV News Channel Live Streaming for free. Watching our Mahaa TV news channel is one of the many ways you can quench your thirst for information, content and entertainment from South Asia. As YuppTV, we are always pleased when we give you the complete pleasure and satisfaction of viewing any content of your choice anytime, anywhere and via any internet enabled device around you. We are innovative and are always looking forward to developing new ways of satisfying your need for content.